To Cite: Ashrafi M R, Shahrokhi A, Tavasoli A R, Hosseini S A, Heidari M, et al. The Efficacy of Cerebrolysin in Improvement of Spasticity in Children with Cerebral Palsy: A Clinical Trial, Iran J Pediatr. 2018 ; 28(1):e60840. doi: 10.5812/ijp.60840. Background: Cerebral Palsy (CP) constitutes a heterogeneous group of developmental disorders resulting from damage to the brain which affects motor system. Cerebrolysin, as a neurotrophic peptide has been used for improving symptoms of patients suffering from neurodegenerative disorders. Objectives: Due to the presence of limited information about the usefulness of Cerebrolysin in CP, this study was performed for the evaluation of Cerebrolysin in the management of spasticity in children with CP. Methods: 26 Spastic CP patients aged between 2 and 6 years entered this study. At the first visit, Modified Ashworth scale for assessment of spasticity was used. Then Cerebrolysin was administered at a dose of 0.1 cc/kg intramuscularly (IM) for 3 months. In the first month, the medication was injected 5 times per week. In the second month of therapy, injections were performed as follows: 4 injections in the first week, 3 injections in the second week, 2 injections in the third week and a single one in the fourth week. In the third month of therapy, Cerebrolysin was continued as weekly injections. The spasticity of the patients was evaluated at the end of the first and third month of therapy. 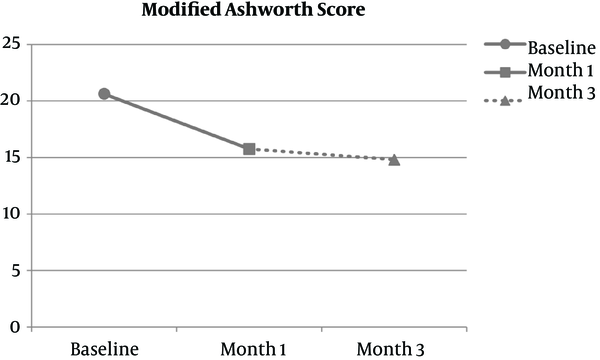 Results: Modified Ashworth score at baseline was 20.62 ± 9.65 which reached 15.19 ± 7.30 after 1 month of treatment. This figure was 14.81 ± 3.77 at month 3. Total decline in Modified Ashworth Scale was 5.42 ± 5.33 at the first month and 5.81 ± 2.74 at the third month in comparison to baseline. The difference between Modified Ashworth Scale at baseline and 1 month after therapy was significant (P = 0.000) but there was no significant difference between first month and third month of therapy. (P = 0.755). Also analysis indicates that there was an association between absolute reduction of Modified Ashworth score and the age at beginning of treatment (P = 0.037). Conclusions: Using Cerebrolysin as a neurotrophic peptide may improve spasticity of children with CP and should be considered as a possible useful treatment in CP cases. Cerebral Palsy (CP) is the most common motor disability in childhood (1) and is considered as a collection of motor disorders caused by brain damage before, during or after birth. This can lead to poor coordination, poor balance, abnormal movement patterns or a combination of all these aforementioned characteristics (2). Although the disease itself is not progressive; the appearance of neuropathogenic lesions and their clinical expression can alter during the time and through brain development. The birth prevalence of CP is approximately 2 per 1000 live births (3, 4). CP is etiologically multifactorial. Known causes comprise a small fraction of cases. The most prominent causes are prenatal asphyxia and prematurity (4). CP classification is based on resting tone and involved limbs. Spastic CP is the most common type and includes nearly 80% of all cases. This type is associated with spasticity, hyperreflexia, clonus and upward plantar reflexes. Other types of CP such as dyskinetic or ataxic account for less than 20% of all cases (5). It is diagnosed with a history of developmental motor delay, persistence of postural reflexes and lack of development of protective reflexes especially parachute in the first year of life. CP frequently begins with early hypotonia in first 6 to 12 months of life which then leads to spasticity (6). Spasticity is the most disabling feature of these patients. So attempts to relieve spasticity can dramatically improve patient’s quality of life. Although rehabilitation is the mainstay of therapy, pharmacological interventions may improve the quality of life of these patients. Various medications have been used for motor problems associated with CP. These medications affect spasticity and abnormal movements such as dystonia, myoclonus, chorea and athetosis. Cerebrolysin is a neurotrophic peptide isolated from pig brain. It consists of 75% free amino acids and 25% low molecular weight peptides (< 10 KDA) (7). There are many studies reporting the efficacy of Cerebrolysin on neurologic disorders. However, most of them were performed in Russia and China. The first studies of this drug were developed in 1973. Cerebrolysin was first used in Russia in patients with cerebroarteriosclerosis (8). Moreover, there were some other studies on treating infantile cerebral palsy (9) and geriatric patients (10) with Cerebrolysin but neither control nor the results of these trials were convincing enough. Later trials indicated the positive effects of Cerebrolysin for different neurologic disorders such as improving extrapyramidal hyperkinesis (11, 12) or autism and Asperger’s syndrome (13). Moreover there are so many studies showing the efficacy of Cerebrolysin in treatment of Alzheimer's disease (14-17). Only few studies investigated the efficacy of Cerebrolysin on CP. Therefore, we designed a prospective study to evaluate the usefulness of Cerebrolysin in management of spasticity in children with CP. This study is a non-randomized non-controlled clinical trial with registration number of IR.TUMS.REC.1394.142077 and IRCT201107226907N3 which involved a total of 26 patients with CP referred to pediatric neurology clinic of Children’s medical center affiliated to Tehran University of Medical Sciences between July 2013 and June 2014. The inclusion criteria were patients who were diagnosed as CP with spasticity between the ages of 6 and 12 years. Exclusion criteria were patients with active epilepsy or renal failure. 45 CP patients were identified initially. From these study candidates, 19 were excluded because of not matching with inclusion criteria and the remaining outpatients started the process of treatment. Modified Ashworth score (MAS) is a suitable instrument for the assessment of spasticity which was used in our cases (18). MAS is based on muscle tone; in fact more increase in muscle tone leads to higher score of MAS [Table 1]. All of the measurements in our patients are taken in supine position, head being in midline and the resting limb position was neutral except for hip measurement in external rotation taken in sitting position. The scores for MAS were determined according to the level of resistance during the passive movement of the antagonist muscles. The muscle groups tested were biceps, hip flexors, internal rotators of hip and hamstrings. The sum of all the obtained scores of muscles of each patient yealds a single MAS for each case. All of our subjects were under occupational therapy for more than a year. To realize the role of this therapy in improvement of their current spasticity, 2 months prior to starting the injection of Cerebrolysin, MAS was obtained and then it was assessed again by starting injections. It is notable no changes in the spasticity were observed during these 2 months. Therefore, we could underestimate this confounder (rehabilitation therapy) during our trial. After assessing spasticity, 0.1 cc/kg of Cerebrolysin was administrated intramuscularly into the gluteus muscle. These injections were performed as 5 times per week for the first month. In the second month of therapy, Cerebrolysin injections continued as follows: 4 injections in the first week, 3 injections in the second week, 2 injections in the third week and a single injection in the fourth week. 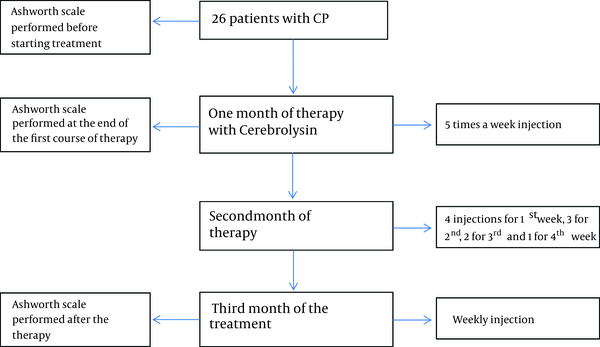 For the third month of therapy, Cerebrolysin was continued as weekly injections (Figure 1). Follow up neurological exams and MAS assesments were done at the end of the first and third month. Results of metric variables were presented as means and standard deviations (mean ± SD); also for statistical analysis independent t-test was used. Descriptive variables were described using percentage and to compare Chi-square was used. The obtained data were analyzed by SPSS V.16 software. The statistical significance was set at P value of < 0.05. 26 patients diagnosed with Cerebral Palsy were studied in this trial. Among our cases, there were 18 boys and 6 girls (69.2% males, 30.8% females). All clinical characteristics are listed in Table 2. Anatomic, physiologic and functional are the most familiar types of CP classification. Based on each sort, we assessed the types of CP in each one of our outpatients (Table 3). The functional level of participants was classified according to the gross motor function classification system (GMFCS) (19). Level 1 represents the children who can walk and run without restrictions but with decreased speed or balance. Level 2 represents those who can walk with railing and minimal ability to run. Level 3 represents those who can walk with assistive mobility devices. In level 4 walking ability is severely limited even with assistive devices and finally in level 5 the voluntary control of movement and the ability to maintain head and neck position against gravity are completely impaired. b(A) Premature Rupture Of Membrane (PROM) was the most common cause of premature delivery comprising 60% of preterm cases while gestational diabetes mellitus and gestational hypertension comprises 26.6% and 13.3% of causes of premature delivery respectively. c(B) From 14 patients with abnormal imaging findings 12 of them had periventricular leukomalacia in their imaging (85.8%) and 1 of them had ventriculomegaly (7.1%) while 1 patient had both abnormalities in the imaging (7.1%). As mentioned before, MAS was assessed at baseline, 1 month and 3 months after therapy. The results are shown in Figure 2. Total decline in MAS was 5.42 ± 5.33 in 1 month and 5.81 ± 2.74 in 3 months of Cerebrolysin injections. These figures are dubbed as 25.05 ± 3.49 percent decrease at first month which reaches 26.08 ± 2.33 percent at third month in comparison to baseline. The difference between MAS at baseline and 1 month after therapy was significant (P = 0.000) but there is no significant difference between first month and third month of injections (P = 0.755). Also analysis indicates that absolute reduction of MAS is associated with the age at the beginning of treatment (P = 0.037). This is one of the few studies, investigating the efficacy of Cerebrolysin on motor improvement in CP patients. In our trial, MAS was the most important parameter for the evaluation of spasticity. In contrast to many other studies on Cerebrolysin, our trial was designed in a form to not only assess the efficacy of this drug in patients with CP, but also evaluate the appropriate protocol of drug use for achieving better results. For reaching the latter goal, we altered the method of administration during the period of therapy. To sum up, in our study MAS was assessed at baseline, one month and three months after therapy. Results showed considerable improvement after the first month – with 5 injections per week – but no significant recovery was observed in month 3 – with 1 injection per week – in comparison to month 1. It seems that with less Cerebrolysin shots in second and third months of treatment the process of progress was diminished. In other words, therapy continuation with less frequent injections maintained the primary level of amelioration, but did not make it better. Also these results can be interpreted as a plateau level of therapeutic effects after the first month of treatment with Cerebrolysin. The authenticity of these assumptions requires further studies with longer periods of assessment. There are few articles writing about the effects of Cerebrolysin on different aspects of patients with CP. A study in 2017 reported that combination therapy of cerebrolysin and rehabilitation improved gross motor function of CP patients considerably (20). Liang X used point injection of Cerebrolysin to treat speech and cognitive function of children with CP (21). He realized that the earlier patient receives treatment, the better clinical outcome would be. This point was achieved in our study too. Another study showed the efficacy of Cerebrolysin for prelinguistic communication defects in infants with primary brain insult (22). This trial reported two new cases with intractable seizures when the treatment began. This condition was controlled with discontinuation of therapy. Until now considering seizure as a complication of Cerebrolysin is in controversy. Some studies’ results (23, 24) indicated that not only patients who use Cerebrolysin are not susceptible to seizure, but also it may have some protective effect for this condition. In our trial, no seizure was reported during the therapy. Also the dosage of 0.1 cc/kg of the drug was well tolerated in all of our cases. Other anticipated complications such as dizziness, agitation or skin flush were not observed either. But how Cerebrolysin may improve the function of patients with CP and neurodegenerative disorders? Many animal studies have been performed until now; but the mechanism of action is still not totally clear. It seems that Cerebrolysin has a neuroimmunotrophic activity reducing the extent of inflammation and increasing the death of neurons, which are under pathological conditions such as those observed in neurodegenerative disorders (24). Different studies on cultured cortical neurons of chicken embryo show that besides having anti-apoptotic and protective effects; Cerebrolysin may stimulate the overgrowth of neuritis (25, 26). More studies in rats showed the increase of nerve growth factor’s expression and its receptor after intracerebroventricular infusion (27). Overall, these studies and other similar trials can, somewhat but not completely, explain why Cerebrolysin is an effective medication for neurodegenerative disorders including CP. Cerebrolysin may at least for a short-term – up to 3 months – improve the spasticity of CP children. Moreover, the earlier Cerebrolysin therapy begins the more it may be beneficial. Longer follow-up time, double blind placebo control and considering other developmental aspects especially cognitive and speech are our suggestions for further studies. Moreover, the effects of Cerebrolysin on function and participation of CP patients should be investigated in future studies. The authors should thank all the patients and their parents for their participation in the study and all the cooperation they had with us. 1. Sellier E, Platt MJ, Andersen GL, Krageloh-Mann I, De La Cruz J, Cans C, et al. Decreasing prevalence in cerebral palsy: a multi-site European population-based study, 1980 to 2003. Dev Med Child Neurol. 2016;58(1):85-92. doi: 10.1111/dmcn.12865. [PubMed: 26330098]. 2. Gulati S, Sondhi V. Cerebral Palsy: An Overview. Indian J Pediatr. 2017. doi: 10.1007/s12098-017-2475-1. [PubMed: 29152685]. 3. Oskoui M, Coutinho F, Dykeman J, Jette N, Pringsheim T. An update on the prevalence of cerebral palsy: a systematic review and meta-analysis. Dev Med Child Neurol. 2013;55(6):509-19. doi: 10.1111/dmcn.12080. [PubMed: 23346889]. 4. Stavsky M, Mor O, Mastrolia SA, Greenbaum S, Than NG, Erez O. Cerebral Palsy-Trends in Epidemiology and Recent Development in Prenatal Mechanisms of Disease, Treatment, and Prevention. Front Pediatr. 2017;5:21. doi: 10.3389/fped.2017.00021. [PubMed: 28243583]. 5. Johnson A. Cerebral palsies: epidemiology and causal pathways. Arch Dis Child. 2000;83(3):279A. [PubMed: 10952658]. 6. Hirsh AT, Gallegos JC, Gertz KJ, Engel JM, Jensen MP. Symptom burden in individuals with cerebral palsy. J Rehabil Res Dev. 2010;47(9):863-76. [PubMed: 21174251]. 7. Hartbauer M, Hutter-Paier B, Skofitsch G, Windisch M. Antiapoptotic effects of the peptidergic drug cerebrolysin on primary cultures of embryonic chick cortical neurons. J Neural Transm (Vienna). 2001;108(4):459-73. doi: 10.1007/s007020170067. [PubMed: 11475013]. 8. Zhovnir IK, Brozhik NS, Krotiuk LN. [Use of cerebrolysin in patients with cerebral arteriosclerosis]. Vrach Delo. 1973;11:109-11. [PubMed: 4786906]. 9. Gershman RN, Vasilenko MA. [Use of cerebrolysin and ATP in treating infantile cerebral paralysis]. Pediatr Akus Ginekol. 1975;(1):22-3. [PubMed: 1228606]. 10. Krauss W. [Clinical experience with Cerebrolysin in geriatrics]. Med Welt. 1975;26(42):1937-9. [PubMed: 1186482]. 11. Lukhanina EP, Karaban IN, Burenok Iu A, Mel'nik NA, Berezetskaia NM. [Effect of cerebrolysin on the electroencephalographic indices of brain activity in Parkinson's disease]. Zh Nevrol Psikhiatr Im S S Korsakova. 2004;104(7):54-60. [PubMed: 15347036]. 12. Noor NA, Mohammed HS, Mourad IM, Khadrawy YA, Aboul Ezz HS. A promising therapeutic potential of cerebrolysin in 6-OHDA rat model of Parkinson's disease. Life Sci. 2016;155:174-9. doi: 10.1016/j.lfs.2016.05.022. [PubMed: 27210889]. 13. Cuevas-Olguin R, Roychowdhury S, Banerjee A, Garcia-Oscos F, Esquivel-Rendon E, Bringas ME, et al. Cerebrolysin prevents deficits in social behavior, repetitive conduct, and synaptic inhibition in a rat model of autism. J Neurosci Res. 2017;95(12):2456-68. doi: 10.1002/jnr.24072. [PubMed: 28609577]. 14. Sharma HS, Muresanu DF, Sharma A. Alzheimer's disease: cerebrolysin and nanotechnology as a therapeutic strategy. Neurodegener Dis Manag. 2016;6(6):453-6. doi: 10.2217/nmt-2016-0037. [PubMed: 27827552]. 15. Alvarez XA, Alvarez I, Iglesias O, Crespo I, Figueroa J, Aleixandre M, et al. Synergistic Increase of Serum BDNF in Alzheimer Patients Treated with Cerebrolysin and Donepezil: Association with Cognitive Improvement in ApoE4 Cases. Int J Neuropsychopharmacol. 2016. doi: 10.1093/ijnp/pyw024. [PubMed: 27207906]. 16. Allegri RF, Guekht A. Cerebrolysin improves symptoms and delays progression in patients with Alzheimer's disease and vascular dementia. Drugs Today (Barc). 2012;48 Suppl A:25-41. doi: 10.1358/dot.2012.48(Suppl.A).1739721. [PubMed: 22514793]. 17. Chen N, Yang M, Guo J, Zhou M, Zhu C, He L. Cerebrolysin for vascular dementia. Cochrane Database Syst Rev. 2013;(1). CD008900. doi: 10.1002/14651858.CD008900.pub2. [PubMed: 23440834]. 18. Ansari NN, Naghdi S, Arab TK, Jalaie S. The interrater and intrarater reliability of the Modified Ashworth Scale in the assessment of muscle spasticity: limb and muscle group effect. NeuroRehabilitation. 2008;23(3):231-7. [PubMed: 18560139]. 19. Morris C, Bartlett D. Gross Motor Function Classification System: impact and utility. Dev Med Child Neurol. 2004;46(1):60-5. [PubMed: 14974650]. 20. Nasiri J, Safavifar F. Effect of cerebrolysin on gross motor function of children with cerebral palsy: a clinical trial. Acta Neurol Belg. 2017;117(2):501-5. doi: 10.1007/s13760-016-0743-x. [PubMed: 28074392]. 21. Liang X. Point injection of cerebrolysin in treatment of child cerebral palsy. Acta Academiae Medicinae Bengbu. 2004;29(4):331-2. 22. Hassanein SM, Deifalla SM, El-Houssinie M, Mokbel SA. Safety and Efficacy of Cerebrolysin in Infants with Communication Defects due to Severe Perinatal Brain Insult: A Randomized Controlled Clinical Trial. J Clin Neurol. 2016;12(1):79-84. doi: 10.3988/jcn.2016.12.1.79. [PubMed: 26365023]. 23. Gorbachevskaya N, Bashina V, Gratchev V, Iznak A. Cerebrolysin therapy in Rett syndrome: clinical and EEG mapping study. Brain Dev. 2001;23 Suppl 1:S90-3. [PubMed: 11738849]. 24. Alvarez XA, Sampedro C, Perez P, Laredo M, Couceiro V, Hernandez A, et al. Positive effects of cerebrolysin on electroencephalogram slowing, cognition and clinical outcome in patients with postacute traumatic brain injury: an exploratory study. Int Clin Psychopharmacol. 2003;18(5):271-8. doi: 10.1097/01.yic.0000085765.24936.9a. [PubMed: 12920387]. 25. Hartbauer M, Hutter-Paie B, Windisch M. Effects of Cerebrolysin on the outgrowth and protection of processes of cultured brain neurons. J Neural Transm (Vienna). 2001;108(5):581-92. doi: 10.1007/s007020170058. [PubMed: 11459078]. 26. Gutmann B, Hutter-Paier B, Skofitsch G, Windisch M, Gmeinbauer R. In vitro models of brain ischemia: the peptidergic drug cerebrolysin protects cultured chick cortical neurons from cell death. Neurotox Res. 2002;4(1):59-65. doi: 10.1080/10298420290007637. [PubMed: 12826494]. 27. Birch AM, Kelly AM. Chronic intracerebroventricular infusion of nerve growth factor improves recognition memory in the rat. Neuropharmacology. 2013;75:255-61. doi: 10.1016/j.neuropharm.2013.07.023. [PubMed: 23932816].